What do you understand by Windows? Windows is an operating system that controls all parts of that computer system on which it is installed. Icons (or graphical pictures) represent applications, files and other parts of the operating system. These are the main part of GUI which help a user to operate some digital device in an easy way. Taskbar is the long horizontal bar at the bottom of your screen. It includes Start button, Quick Launch toolbar, Open Application toolbar, Notification area and Show Desktop button. Where is the title bar located? The title bar is the horizontal bar located at the top of a window. It displays the name of the window or software program being used. The Maximize button in Windows is the middle button with square. It allows the user to enlarge a window, usually making it fills the entire screen. Name any three Windows accessories. How do you start the Paint in your computer? What is the use of Navigation Pane in folder window? Navigation Pane offers to access libraries, folders, saved searches and even the entire hard disk pane, contents etc. For what purpose, left clicking is often used? Left clicking is most often used to select or open a file/folder. A folder is a location or storage space where programs, files and other folders can be located. Documents is a folder that stores user’s important files and folders that are used with many of the programs running on your computer. Explain Windows as a graphical user interface. Windows is a Graphical User Interface (GUI) which is developed, marketed and sold by Microsoft. It has pictures (graphics) that you use to communicate (interface) with the computer. This type of system is popular because it is logical, fun and easy to use. Start menu is a gateway to the applications. Describe it. The Start menu is a gateway to the applications that are present on your computer. The left side of the Start menu lists programs, and the right side allows access to common windows folders. It also provides access to Help and Support, Search and Run options. What is the significance of icons? Give the example of any three types of icons. Icons refer to graphic symbols that represent window elements. The three types of icons are as follows- the application icon, the shortcut icon and the document icon. List some main components of a default window. Discuss the features of Title bar. Title bar displays the name of the window or software program. This bar can maximize, minimize, restore or close a window. It is also used to move a window using any pointing device. What do you mean by Menu bar? It is situated below, the title bar. It contains various options such as File, Edit, View, Tools and Help menu items. The menu bar can really help you in managing your daily routine tasks. Sometimes menu bar does not display on the screen. To make it appears on the screen, go to Organize —> Layout —> click on check mark Menu bar option. The bottom line of any window is called Status bar in which an application can display various kinds of status information such as current window’s state, background tasks (such as printing, scanning etc) or other contextual information (such as selection, etc). How to create a sub-folder within a folder? Step 1: Open the existing folder. Step 2: Right click on a blank area. Step 3: Point to New and then click the Folder. Step 5: Type the new name of sub-folder and press Enter. Write the difference between copying and moving files/folders. Copy a file/folder is to make a duplicate copy of the selected file/folder and place at the target location. Move a file/folder is to transfer the original file from the original location to the target location. It can be done when the original folder is taken to a different file or folder than the original. It can be done when you drag a folder to a similar file or a folder. Your hard drive (the drive inside your Computer icon) is known as the (C:, D:, E: ) drive. Hard disk drive is the location where all files are stored in any computer. In Windows, the name of hard drive start from C: drive because it is the first available drive letter. The computer assigns A: and B: drives to floppy disks and sometimes other removable media such as tape drives. Write all the functions of Minimize button. The Minimize button is among the three buttons at the right end of the title bar. This button has a small dash (or minus sign). It shrinks the window and places it on the taskbar while leaving the program running. To go back to this window, click on taskbar where it is shrinked. What is a Restore button? After a window is maximized, the Maximize button changes to the Restore button. It looks like two windows near one another. If you click the Restore button, the maximized window shrinks to its previous size (the size before you maximized it). GUI has become a standard way of how to users interact with a computer? Its one feature is WYSIWYG. Give full form of both abbreviations used in the above paragraph. Write one other feature of GUI. GUI Graphical User Interface WYSIWYG What You See Is What You Get. GUI contains icons that represent files, folders and other applications. Explain Graphical User Interface (GUI) with its features. It is a visual environment for representing programs, files and options with graphical images such as icons, menus and dialog boxes on the screen. The user could select and activate/deactivate these elements by pointing and clicking with a mouse or often with the keyboard. A pointing device allows the user to identify and select the necessary commands by moving the cursor to a certain location on the screen, e.g. Mouse, joystick etc. The object being manipulated remains visible on the screen before the manipulation and after the manipulation. WYSIWYG (What You See Is What You Get) means that a printed document is exactly a copy of what you see on the screen. A GUI provides adequate messages and information from time to time depending upon the application. Quality of reversal is the ability to revert the previous state of action. Icons represent files, folders and other applications. Dialog boxes, sliders, buttons, check boxes allow the user to inform computer, what to do and how to do. Graphical display of the current actions informs the user regarding the current action and a method to interrupt the same action by using graphical animation. What do you mean by desktop? 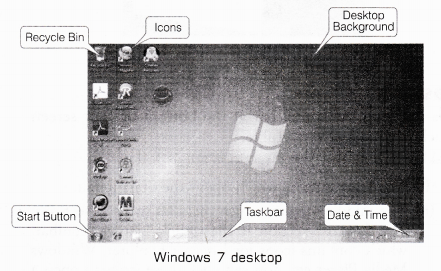 Explain the Components of Windows 7 desktop. When a computer is booted up and ready to use, then the screen we see is called the Desktop. Start Button It is a tool by which you can open menus, start applications, files and settings. Taskbar It is located at the bottom of the screen which contains the Start button, shortcuts to applications, date, time etc. Date and Time Settings On the right side of the taskbar, you will see date and time option, which is used to set date and time. Desktop Background It is an image used as background of a GUI on a computer screen. It is also called wallpaper. Recycle Bin It is a container which contains deleted files, folders etc until, the ‘ are finally removed from the hard disk. If you want to restore the deleted files/folders, you have to go to the recycle bin (by left clicking it twice) right click on the document and choose Restore from the given options. After doing this, the desired document will be restored on its original position. Computer This folder is a source to retrieve all the information and resources attached to the system. It allows the user to explore the content of his/her computer drives as well as manage the computer files. Icons (or Graphical Pictures) It is a small graphical representation of a program applications or tiles. When user click on icons, the associated program opens (run). Icons are the main part of GUI in order to help a user to operate a computer system or any digital device in an easy way. The three types of icons are-the application icon, the shortcut icon and the document icon. Aero It is a visual desktop experience, which provides an easy way to access desktop. What are shortcuts? Explain the steps to create shortcut. Step 1: Right click on the desktop or the area where you want to place the shortcut. In the right click menu, point to New and then, select Shortcut. 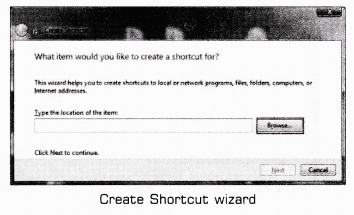 Step 2: The Create Shortcut wizard will open as shown below. You need to select the path to the program, click on the Browse button to begin. Step 3: Navigate to the folder where the program is located and select it, click the OK button. Step 4: Press the Next button to continue. Step 5: You need to enter the name of the shortcut in the ‘Type a name for this shortcut:’ field and finally, click Finish button. What are the some important programs of Accessories? Calculator It offers advanced capabilities of a programming, scientific and statistical calculator. Text Editor It refers to a simple Word processor application that is used to create and edit text. Paint It refers to a painting tool that is used to create drawings on a blank drawing area or in an existing pictures. Describe the basic operations of mouse button. Pointing Pointing to an item on the screen means moving a pointer to a certain location. When you point to some object, a small box often appears, that describes the item. Left Button-Double Clicking It is used to open the items on your desktop. To double click an item point to the item on the screen and then click twice quickly. Dragging It is used to move files(or folders) to different locations and to move window (or icons) around your screen. to drag an object, point to the object on the screen, press and hold the left button, move the object to a new location and then release the button. Right Clicking It is usually used to display a list of operations that can be performed with the associated item. Right click an item, point to the item that you want perform and then, click the left button. Which folder is used as a convenient place to store important files and folders of a user? Documents is a folder that provides convenient place to store important files and folders. When a user saves a file, the file is automatically saved in Documents unless the user has chosen a different folder or drive. To reach Documents folder quickly, user can use Start menu or double click on the Documents icon placed on desktop. What is a File? Explain its functions. These are the collection of information. In fact, almost all type of information is stored into the files. There are many types of files stored in different formats including operating system files, program files and your personal files. Different types of files contain different types of information. Each file has a specific filename and has a file extension that identifies the file type. (The filename and file extension are separated by a period (•)). e.g. A document created using WordPad might have the filename John.rtf. Name the different filename extensions and specify, when they are used? Describe the various parts of the folder window. Navigation Pane Offers to access libraries, folder, saved searches and even the entire hard disk, pane, contents etc. 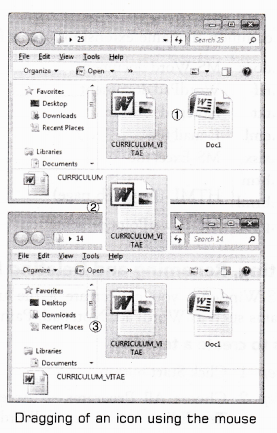 Backward and Forward Buttons Used to navigate between previously used and current folders. Toolbar/Command Bar Used to perform some files related common tasks. Address Bar Used to navigate directly to a different location from one folder/directory to another. Search Box Type a word or a phrase in the search box to look for an item in the current folder or library. Column Heading Use the column heading to change how the files in the file list are organised. File List This is the list of contents of the current folder or library. Write the steps to rename and delete a folder. Step 2: Right click on the folder icon. Step 3: Choose Delete option from the drop down menu. Step 6: The folder is deleted and moved to the Recycle Bin. Describe the concept of tiling and cascading windows. Sometimes, moving and resizing multiple windows can create confusion. To keep better track of multiple windows, try cascading or tiling the windows. In cascading, windows are layered on the top of each other. Step 1: Right click on the taskbar. Step 2: Click Cascade windows. In tiling, windows are next to each other. Windows can be tiled horizontally or vertically. If windows are tiled horizontally, they appear one above the another. If windows are tiled vertically, they appear side-by-side. Step 2: Click Show windows stacked (for tiling horizontally) or Show windows side-by-side (for tiling vertically). Sweety wants to use an operating system based on graphical user interface, suggest her a name. Also, tell what is the meaning of graphical user interface? Windows is an operating system based on graphical user interface. Graphical user interface means that it has pictures (graphics) that you use to communicate (interface) with the computer. Raj at is a commerce student and wants to do his homework but somehow he has lost his calculator and wants to take computer’s help. He has Windows 7 on his system. Suggest him a way to do so. Rajat can use calculator in the system that can do simple as well as sophisticated calculations. Click Start —> All Programs —> Accessories —> Calculator. Naman wants to change the background image of his Laptop. Can he set his image as wallpaper? Write down the labels in order to show how Naman could change the wallpaper. A. Desktop Background window will appear. B. Click the Start button, and then click Control Panel. C. In the Picture positions list, choose any one option (such as Fill, Fit, Stretch, Tile or Center) which you want and click on Save changes button. D. Click the picture that you want for your desktop background. E. Click the link Appearance and Personalization. F. If your desired picture is not there, click the Picture location list to view other categories or click Browse to search for the picture on your computer. G. Under Personalization, click the Change desktop background. Ram wants to create a text file to store name and roll number of his students. Suggest, which program he should use. Write down the steps to create the file using the suggested program. Step 2: Choose All Programs —> Accessories —> Notepad. Step 4: Type name and roll number of students. Step 5: To save file, click File button —> Choose Save As option. Step 6: The Save As dialog box will appear. Step 7: Give file name with extension. Step 8: Click Save button. Yesterday, Rahul created a file named detail.txt and saved it. Now, he wants to open it but he has forgotten where he saved it on his laptop. Suggest him a way to find the file. He can find his file by using Search option. Saurabh was working on a project. By mistake, he deleted an important file. Can he get the file back? If yes, then specify the steps also. Yes, he can restore his file to its original location. Step 1: Open the Recycle Bin. Step 2: Click the file, he wants. Step 3: In the Recycle Bin tasks list, click Restore on that item which you want. Thus, file will be restored to its original location. Suppose you move or copy a folder named Alignment. The Alignment folder contains four subfolders, namely Left, Center, Right and Justify. When the folder is moved/copied to another location, will it carry with its the four subfolders Left, Center, Right and Justify or not? Yes, the Alignment folder will carry the four sub-folders Left, Center, Right and Justify because when we move or copy a folder to a new location, then all its contents (i.e. sub-folders and files) also get moved or copied. It is a rectangular area showing an application, document, contents of a folder or a dialog box. (b) Window is a rectangular area, which shows an application, document, contents of a folder or a dialog box. (c) Desktop is the first and main screen area that you see after your Turn ON your computer and Log ON to Windows. (a) When you delete a file/folder it goes to the Recycle Bin. (b) Deleted files are actually not removed from your hard disk until you empty the Recycle Bin. So, a file deleted from a folder can be restored from Recycle Bin. (c) Date and Time are the part of taskbar which is found at the bottom of the screen. It is used to start programs, obtain help, search for files and folders etc. (d) Start button is used to start program, obtain helps, search for files and folders etc and also displays the most commonly used programs in a particular context. (a) Title bar contains the title of a currently opened page and it is present at the topmost line of a window. (d) An application can be opened through the shortcut made on desktop by double clicking on its shortcut icon, pressing Enter or Right clicking and choosing Open button. It can contain files as well as folders. (b) Folder is a location in which you can store files/folders and sub-folders. (c) Minimize button reduces the window on the taskbar. (b) Maximize button enlarges the application window to fill the whole screen or enlarges the window to its original size. Next version of Microsoft Windows after Vista and XP is …………. ………….. feature is available in Windows 7 ultimate for data security. ……………. means that a printed document is exactly a copy of what you see on screen. ………….. is the background image of display screen on which windows, icons and other graphical items appear. …………. represent graphical representation of various files and programs of an operating system. ………….. is the desktop icon where you send file or folder, if you want to delete it. ………….. is a visual desktop experience which provides an easy way to access desktop. The ………….. is the long horizontal bar that you see at the bottom of your desktop. ………… allows you to open menus, start applications etc. ………….. are desktop icons that links to particular files and programs. The ………….. contains various options such as File, Edit, View etc. ……………. are the collection of various information. A ………… is a hardware device on which you can store files and folders. The ………….. shrinks the window and places it on the taskbar while, leaving the program running. To keep better track of multiple Windows, ………….. or tiling is used. Windows is an operating system that lets you use different types of applications or softwares. Windows allows us to use a Word processing application to write a letter. It also lets you to use different types of applications or softwares. Windows 7 is available in three editions. Windows 7 is available in three editions namely- Windows 7 Home Premium, Windows 7 Professional and Windows 7 Ultimate. Status bar is primarily used to switch between open windows and applications. Status bar is not used to switch between open windows and applications but it simply shows the status of currently running applications. Toolbar is the part of the folder window. 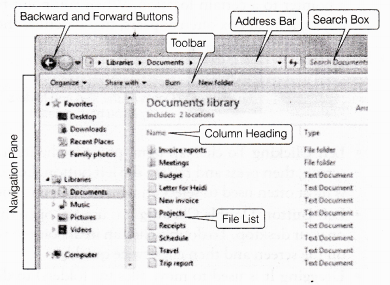 Toolbar is the part of the folder window which is used to perform some files related common tasks. The small pictures on the desktop are called icons. Icons are the pictures representing elements like files, folders, shortcuts etc on the desktop. Aero is used as a background screen of a GUI on a computer screen. Aero is a visual desktop experience that provides easy way to access the desktop. When no object has been deleted, the desktop does not contain the Recycle Bin folder. The desktop always contains the Recycle Bin folder whether object has been deleted or not. The scroll bar feature comes with scroll arrows that allow you to move easily through a document. Depending on the size of a window, the entire application may not be visible. So, it is the scroll bar which makes the whole screen visible for you by using scroll arrows. When you delete a shortcut, the original item still exists on your computer in its original location. When a shortcut is deleted, the original item exists on its original location without any changes. The filename and file extension are separated by a period. The filename and file extension are separated by a period because different, types of files store different types of information and each type of file has a file extension, which identifies the file type. Computer is a folder that provides you with a convenient place to store your important files and folders. Computer is an icon on desktop. It does not store files and folders, it simply helps you to display the folders contained on that drive. The size of a Notepad file should be more than 64 kilobytes. The size of Notepad file should not be more than 64 kilobytes that is stored in ASCII format. When a folder is copied to another place, sub-folders in the folder also get copied. When a folder is copied to another place, all its sub-folders alongwith their contents also get copied. To work on a computer, you should know its internal architecture. To work on a computer, you do not need to know its internal architecture.